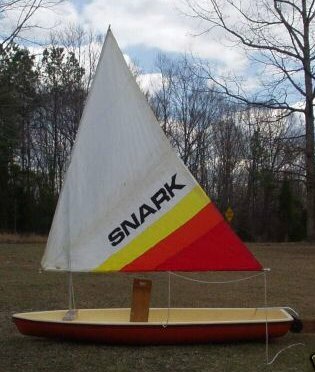 Early SNARKs were one of the most popular sailing boats ever. This is partly due to the fact that they could be purchased with 'product coupons'. For example, a large number of Kool cigarette coupons could be redeemed for a SNARK with the Kool logo on the sail. It was also possible to purchase a SNARK with the KOOL logo (without smoking a single cigarette) for $99. The Kool ad campaign reportedly received 18000 SEA SNARK orders in 1971 alone! Most later SNARK's are made of styrofoam with an outer layer of ABS for improved durability.